Camping in the real world is a recreational activity that takes place outdoors. It is usually away from the hustle and bustle of city life and in the woods, mountains or near a lake. Camping is a chance to be one with nature and enjoy the fruits of the earth. It is not a past time for everyone; one must have some skills to spend time in the wilderness. Building a fire, fishing and knowing the difference between poison ivy and berries from resource that can be used, is important. Just be sure to bring plenty of water, insect repellent, a good pair of hiking boots, comfortable clothing and a rough sack full of camping essentials. 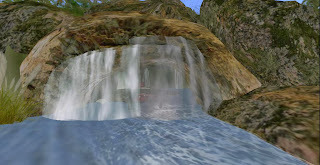 In Second Life, camping can also be a fun an exciting way to explore virtual nature. 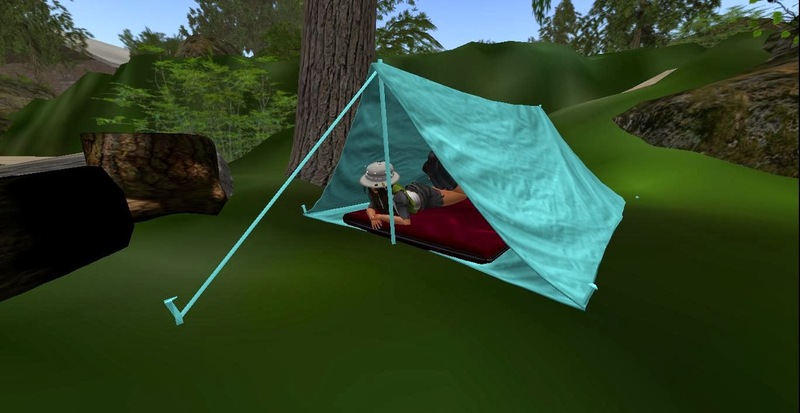 Many of the activities that are done in the real world can be mimicked virtually and King Izzy’s Camping Adventure is just the place to explore the wild. Izzy’s Camping Adventure is a full sim built by Jules Fetuccio in honor of her Second Life grandparents; Mysti77 and KingIzzy. 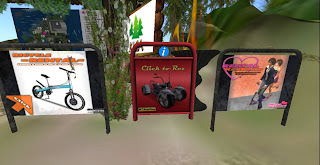 Starting at the landing point you will see a map with an assortment of activities, locations for cabin and tent rentals and if you click on the map it will give you a note card and map to keep with you. To begin your journey, you can either walk the beaten paths or rez a bicycle, ATV or kickboard to get around. If you are into hunting, bring your own gun or pick up a free one and begin stalking for animals. There are hunting and fishing contests you can join for a group experience. Not much into hunting but love outdoors? Go to the beach and lie on the sand and do some tanning or hop on a jet ski and tread the open water. The beach area also has the famous Humanoid dance hud inside the fire pit. Rather go fishing? There’s a wonderful dock you can stand or sit on and sling your line for a catch. The camping activities continue with a picnic area and playground where you can make it a family trip. All are welcome, including kids. You don’t have to take a day hike, feel free to stay over in a tent or rent a cabin overlooking the water. The view is amazing with mountainous terrain, a calm lake and foliage all around. 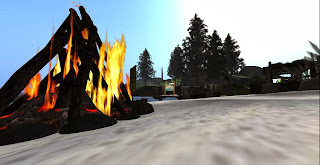 Crack open a beer with some buddies and stalk deer, mountain lions or bears from one of the tree perches or anywhere around the sim where an animal might be lurking. 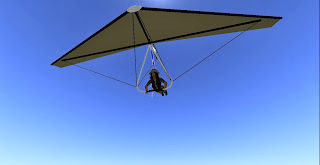 During your stay be sure to hang glide for an aerial view of what other hidden treasures King Izzy’s has to offer. You might just find a hidden cave. 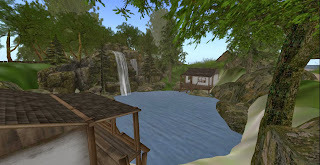 Lanai: Hi Jules, this is an amazing camping adventure that you have created in honor of your grandparents; Mysti77 and KingIzzy. I really enjoyed my visit. Can you share with our readers more about why you decided to create such a sim and the activities available here at King Izzy’s Camping Adventure aka KICA? Jules: After talking to my grandparents, and knowing they aren't builders, I found out what their goals were for the sim. I told them I'd build it for them. Izzy wanted a club and Mysti77 wanted a fishing area and cabins. So I set to work creating my first big build, which took me months to complete but I think it was worth it. I'm always tweaking something or changing other things to fit the needs of visitors or my grandparents. Shaving off prims etc. so the sim has really evolved since May, 2013. It's been a labor of love for two very special people who I just adore and have been with for the past 5 years. Lanai: Your thoughtfulness and attention to detail is very noticeable Jules. Mysti77 and King Izzy, you two have got to be so proud of your granddaughter Jules. She has really gone out of her way to create an authentic camping experience, what kind of activities do you most enjoy doing here? Mysti77: I'm so very proud of Jules for building such a beautiful place. She has done an outstanding job! Well, I like to fish and ride the 4-wheelers around, but sometimes it's really nice to sit around a campfire roasting marshmallows telling spooky stories. Lanai: This type of family unity is very refreshing to see in Second Life and it really reflects off of the whole camping adventure because the activities your sim offers is fun to do with family and friends. King Izzy I was told you like to spend your time hunting when you are here. There are hunting and fishing contest, can you tell me more about these tournaments, when they happen and where to get the equipment needed to participate? King Izzy: The hunting Contest is a monthly contest and the top hunter wins 500L. Most SL guns will work and we also offer a free shotgun for those who can't afford a gun. All the information can be found in our Information Booth. We host Fish Hunt Fishing where people can earn Lindens and gain fishing experience. A free starter rod can be obtained from the market place. Lanai: That’s great, I like that you offer free equipment for those who might be new to SL and unable to afford them. During my exploration, I noticed there was a club, this is pretty unusual for camp grounds, what type of events happen there? Jules: Club houses aren't really all that unusual for campgrounds. It's there for entertainment. It's basically a campground club house for residents and visitors to use for parties. Lanai: Oh it is that type of facility! That is pretty cool. I can see it used for family reunions, birthday parties and maybe even wedding receptions. You also rent cabins here on the sim, do you currently have any available? Jules: Yes we have 5 large cabins furnished cabins available at 250L week/50 prims. These are prims they can leave out in their cabins for decorating, but everyone has rez rights so if they want to bring their own boat that's fine just pick it up when you're done. Please don't leave it out. We also have two small cabins at the pond that were recently put in. They're just adorable. They'll be the same rate. All the cabins will also include a one room skybox overhead for privacy. I'm still working on those. All the cabins are furnished and those items don't count toward their own prim count. I can remove anything a resident doesn't wish to have there. We also have small campsites available to rent. Lanai: That is a nice rental price for such a beautifully designed sim full of things to do. Are there any rules and restrictions for participating in any of the activities here at King Izzy’s? 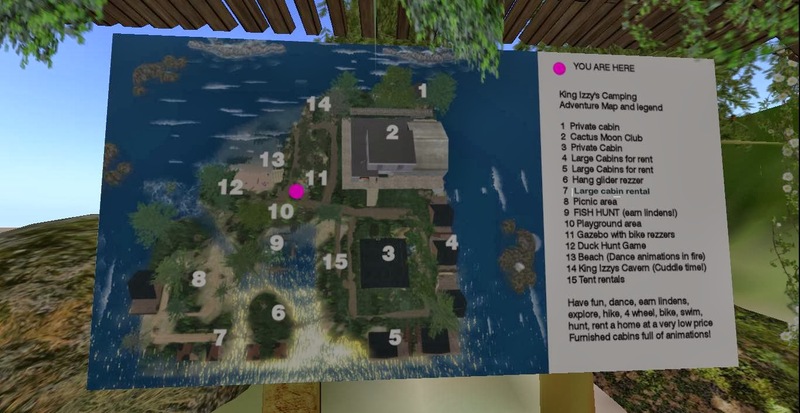 Jules: Well The only rules so far are if you rez a boat or truck please make sure it's not over 50 prims and pick it up when you exit the vehicle, that way it doesn't hog the resources for everyone else. Also do NOT cam into other people’s cabins and check the rent boxes on each parcel before entering a cabin. If the box is green its unoccupied and you can check out the cabin, if it is black then stay out people are paying money to live there and they don't want strangers wandering through their house. I'm sure if we find an error or a problem it will be corrected as we go. Lanai: I agree, I wouldn’t want a stranger wandering around my home either lol. Do you have a group that avies can join for camping events and activities? Lanai: Is there anything else you would like to share with our readers abut King Izzy’s Camping Adventure? Jules: Yes, Even though we are a camping sim you can live here as long as you want. You don't need any kind of hunting or fishing or camping skills here. You're welcome to role-play or not and any kind of avatar is welcome. 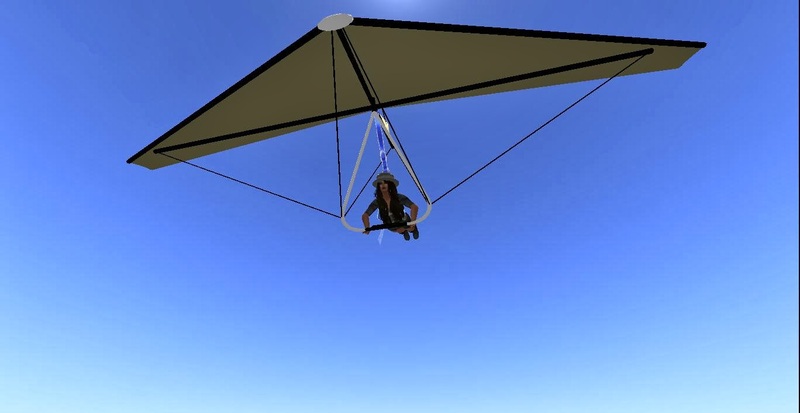 We've put out just about every form of activity we can think of on the sim. 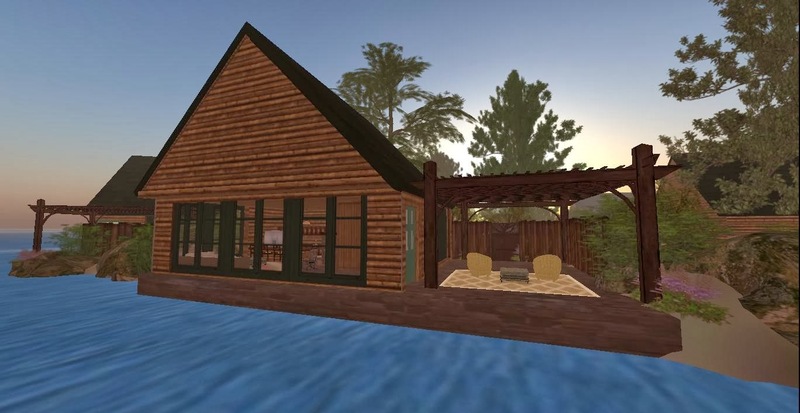 We have a cavern with a private dock inside for cuddling, dance hud on the beach, jet ski rezzers that you can use to race all around the whole sim or up and down the river ways. 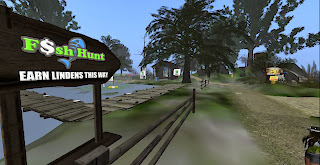 Fish Hunt and a hunting contest to earn lindens. We also have no lag and the cabins are available to rent year round if someone chooses to. They are waterfront properties, on their own parcels so the neighbors cannot hear what you are saying. Privacy is important.